A frying pan becomes a skillet? Posted: Thu Sep 22, 16 6:58 am Post subject: A frying pan becomes a skillet? Saucepan conversion to a skillet. 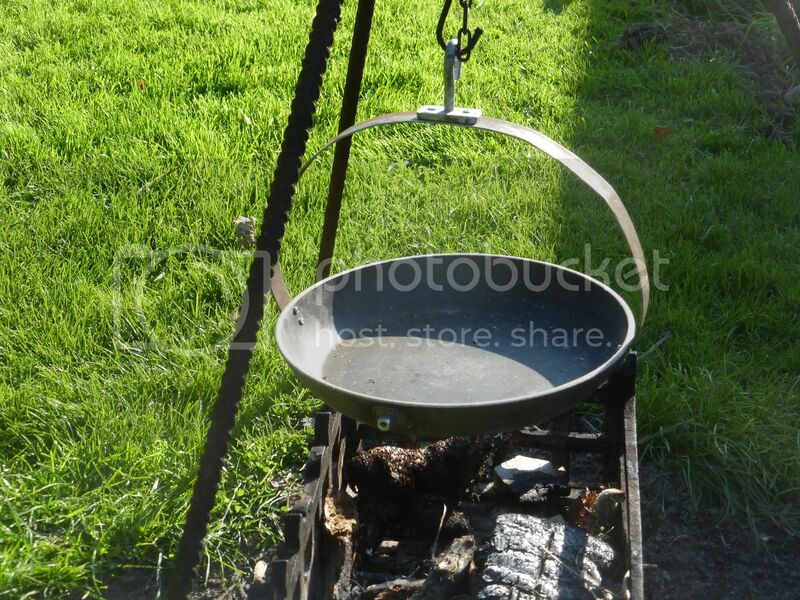 I've been fancying getting a skillet to go an outdoor fire with my tripod for sometime now but at a price in excess of thirty quid, I've been frightened off. Today, we 've taken the handle off an old Frying pan and made our own. We made the handle out of mild steel, drilled holes in the pan and then pop riveted on. How simples that? I've just used my new skillet to poach some eggs and enjoyed them on toast. Tom made the tripod for us out of steel reinforcing rods, which again was a real saving on the one's advertised and here's a factory made skillet that we based our design on. i suspect much of that sort of kit sold online is intended for the glamping market and the less than authentic reenactors . 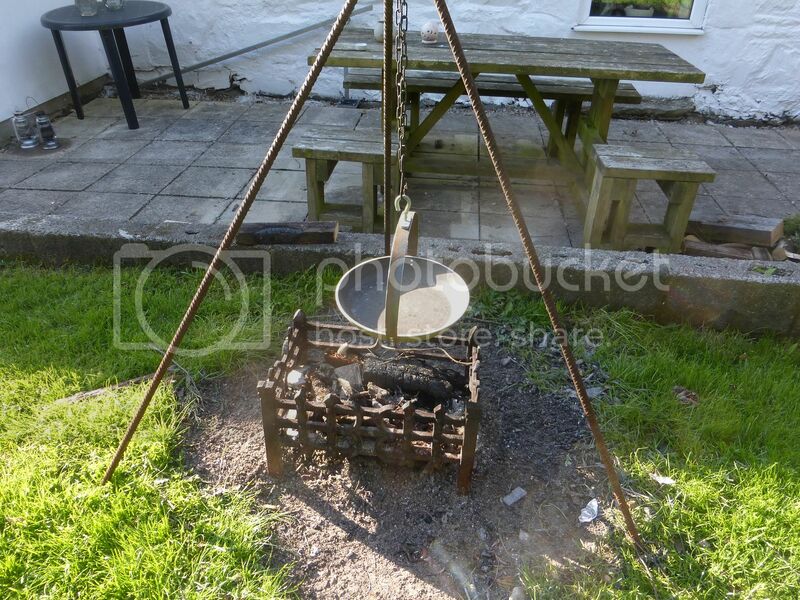 rebar is ace stuff ,on top of that firebox a few short bits would make a pretty good pan rack for a boiling pot if the dutchy is on the hook slow cooking a stew. a rebar grid rack with some hooks makes a very good roasting thing and the juices can fall into a tray under the rack but beside the fire. one of the best re purpose life hacks we discovered for open fire cooking is that a cheap steel wok put dome up on the fire is the perfect tool for cooking chapatis. far faster than a flat thing, more even cooking and much easier to get the cooked one off and next one on . we got it down to about 35 seconds which is ace if you need to do a lot as by the time they have got a bowl,a spoon and some curry the next one is ready. Can we have a photo showing all of the tripod please. I need to wait for at least a birthday, though. I'd wait until my 100th birthday before I forked that much out but then I'm a tight wad ! Jema, we kept it as simple as possible. We hammered out a loop on the top of each rod and then used the chain that we hang the pans from to bind them together. I can see doing something like that, in my ever expanding pit. 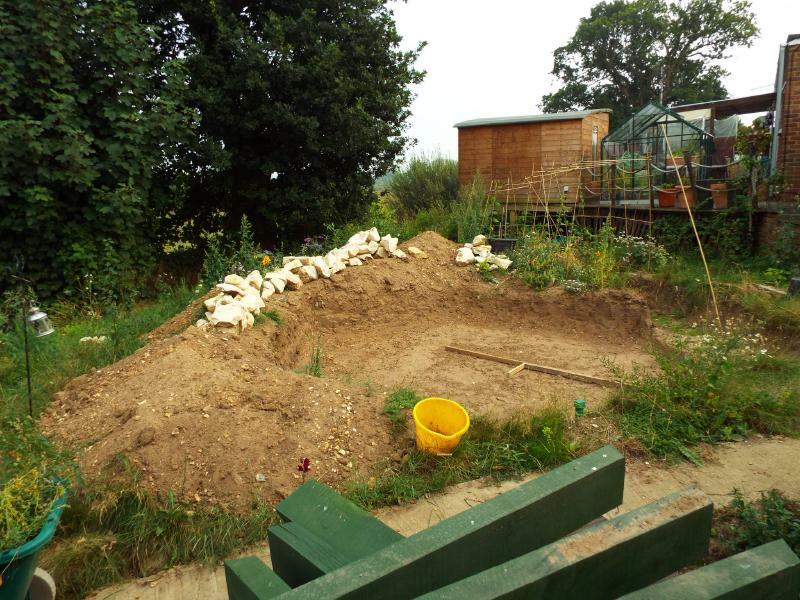 Pit has come on a bit since that pic, and is now loose lay brick. with a few bit of repurposed stuff and maybe �30 of bought bits making that rig is fairly simple. the top of the tripod is rather nice bodger, my version is just a ring with a chain .pop the three leg ends through the ring,spread the feet ,job done. the very simplest is just a chain and any sort of available pole for the legs ( not jan or georgi ) a simple knot will tie the poles together. a little trickier is a single pole with stub branches or notches to hold the pan handle held at the base over one log or rock by a heavier one on the end so it goes over the fire at an angle . What I'd really like to finish things off is a Shepherds hut but I can't see me ever getting a nod of approval from the boss. A nice thought though. 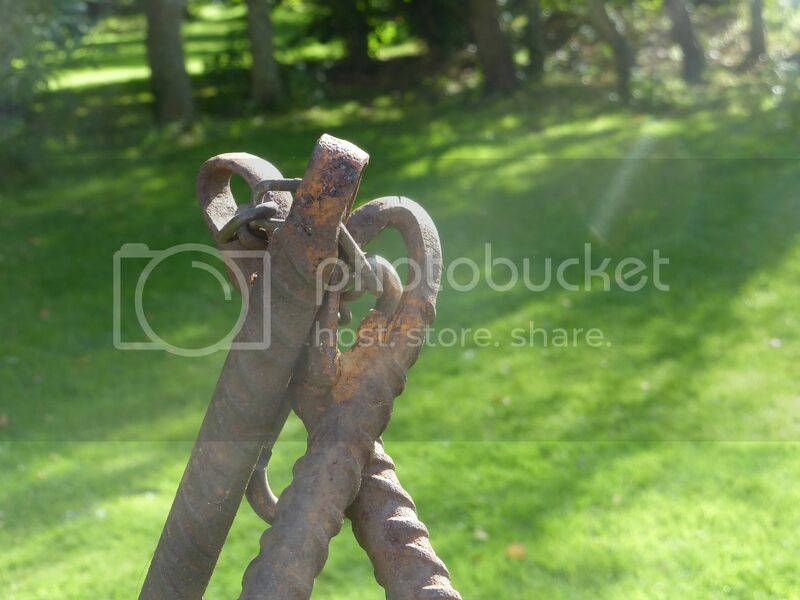 Nice tripod, but if it is welded it has to stay as a tripod doesn't it? I like the idea of linking with a ring, chain or even wire so that it can be folded flat, but depends how you want to store it and how often you will use it of course. When I think that in Guides we didn't have all that stuff, just had to turf, light a fire with no more than two matches, cook (although we were allowed pans, usually army surplus in my time), then clean up so nobody would have known we had been there, I see that outdoor cooking has come on a long way since then. I have a Dutch oven/small cauldron with legs, so it doesn't need to be suspended. We make a fire in a pit made of two rows of redundant bricks with a bit of metal grid over the top for all but the stews. I have to own up that I've chested a bit this time and sent off for one of these. We'll get lots of use out of it. We love a good fire. nice ,i used to have a couple of pressed steel ones that were ok but a bit prone to burning before the middle was cooked . That 'chested' should have read cheated.